Caption slip reads: "Photographer: Lapp. Date: 1959-06-30. Reporter: Kasindorf. Assignment: County Museum -- Old Mayan art -- Guatemala. 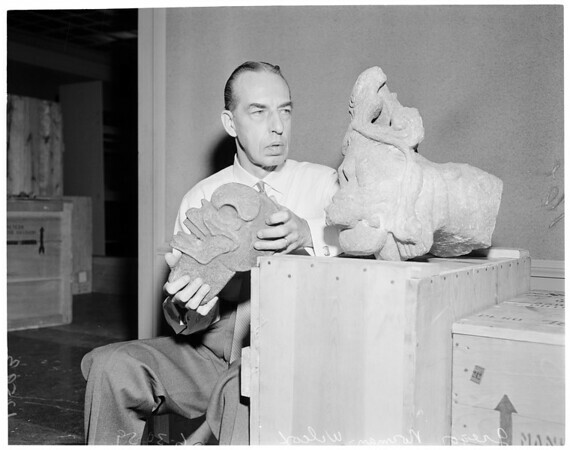 15/16: Gregor Norman-Wilcox, curator of decorative arts at LA County Museum, hold Mayan stone head (Death God), 600-900 A.D. On crate is Honduran stone head, AD 600-900. Above are part of exhibition of ancient Mayan art, which arrived at Museum today (yesterday). 55/56: Norman-Wilcox uncrates effigy of man with jar on back, found in a tomb. Guatamala, AD 200-500".